I am impressed very much with this gallery. I have grown up in Ankara and know Kale and its surroundings very well. Whenever I come back to my home country for a holiday, I spend some time in Ankara, especially in old town and take hundreds of photographs (hoping sort them out one day and display here). I can see that your pictures here are overwhelmingly better than the ones I took. You reflect old Ankara and people living there in this gallery perfectly well. I couldn't do better at all.. Congratulations. Thank you. Another informative and beautiful gallery with great images. Hi! Well.. I have to tell you that your photos are great! I'm from Argentina and I'm 15 years old. I don't speak English very well, so please sorry for my bad English. I discovered your pictures because I had to do a School Project about Turkey, and I think that it's a fantastic place! I really love it, and I love your photos, so I wanted to write to you this. Lovely pictures. I spent 5 weeks in Ankara in Feb-96 at the Sheraton...thinking I'd be there 18 months to 4 years at least. I'm with the USA tax agency, Internal Revenue Service and was to be the on site consultant with the Directorate General of Revenue for a World Bank Public Financial Managment project. The late 1995 election changed all that and the contract was never signed...but still a great and unforgettable experience for a lifetime. The hill side low income housing pix from the Citadel bring back a lot of good memories...as well as the Roman Baths. The adorable pictures you have taken took me with a storm and made me deeply emotional! 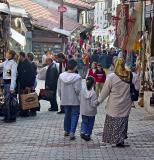 Thank you for taking soo beautiful pictures, capturing the significant essence of Ankara's Old City and sharing them! I'm going to Ankara after not being there for years and your pictures made me realised how important it is to capture valuable moments we take for granted, but will appreciate them years after! Again, Thank you for the marvellous Pictures! Prodigious collection of images, with some of them of enormous beauty, Helen! Thank's for this interesting tour! This is an awesome collection of stunning images. I was in Ankara briefly years ago but was not able to explore much. Your pictures have allowed me to do just that. Thanks. I've just found this site and seen your pictures. as possible. Ankara, wait for me! pictures about "ankara kale" compared to yours. newly i seeing your pictures. i said that follow your works.